Think of the time when British came over Subcontinent, great changes have been occurred in history regarding nations, government, agriculture, culture, traditions, languages and not to forget about cuisines. British people brought their trends, techniques and varieties to rural habitats of subcontinent who were far away from those specialties. 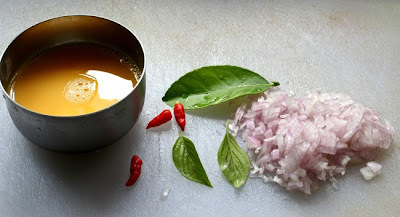 With the change of time British influenced every field of life as well as food, this leads sub continent food to Anglo-Indian cuisines derived from traditional British cuisine. One of these Anglo-Indian food is Akuri derived from British Scrambled Eggs, Akuri was developed by Parsi Indians, which is a spicy scrambled egg dish eaten in Parsi cuisine.The spices used are ginger, coriander, chopped chilis, and black pepper; minced tomatoes are commonly added.Akuri is traditionally eaten with pav or double roti (types of Indian bread) and for this reason is somewhat liquid in texture. Further to this Muslim people adopted Akuri, which is known as Khugina, Egg bhurji or Anda bhurji in modern times Pakistan, the only difference in Akuri and Khugina is cooking style, The difference lies in its preparation and addition of sautéed chopped onions, chilies, and optional spices.It is usually served with rotis or bread. 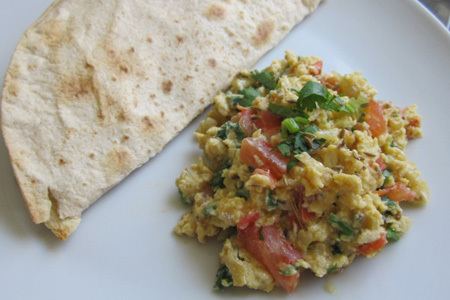 As I belong to Pakistan, so I preferably cook Khugina with my own style, by adding of tomatoes and cilantro, which is the easiest eggs recipe ever, I really enjoy this scrambled style eggs in morning as breakfast with a cup of tea. Moreover, it can be convenient to cook when you came home late at night. Continue to stir the eggs swiftly, for another 5-7 minutes, until they are at the point of setting and resemble soft custard. Make sure to keep scraping the bottom and sides of the pan. Serve immediately; while warm and creamy. Paneer may be substituted for the eggs. Tomatoes can be added to the beaten eggs before adding them into the pan giving the dish a tangy flavor. Boiled potatoes cut into small cubes are added to make the dish more filling. Peas, carrots, capsicum and other similar vegetables can be added to the dish, improving the dish's taste and its nutritional value.